Crafted from reclaimed sycamore, this rustic piece is designed with rings on each end for easy gripping. Get a handle on your serving situation with this rustic cheese board. Cody Hughes and Ali Wedewer designed it with rings on each end for easy gripping, reducing the chance of a tragic gouda casualty. Cody crafts each one from reclaimed, locally sourced sycamore, shaping it to a smooth polish while still maintaining an organic form. 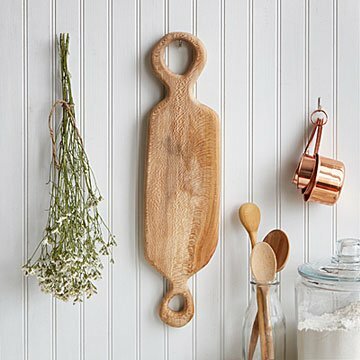 When you're not setting out delicious snacks, hang it up and bring a little woodsy whimsy to your kitchen decor. Fun fact: The board's shape was inspired by Italian painter Amedeo Modigliani, who's known for his elongated profiles. Like string cheese, but with faces. Handmade in Philadelphia. 21 x 5.25 x 1"